You know how much I love sharing the joys and frustrations of cooking with you. 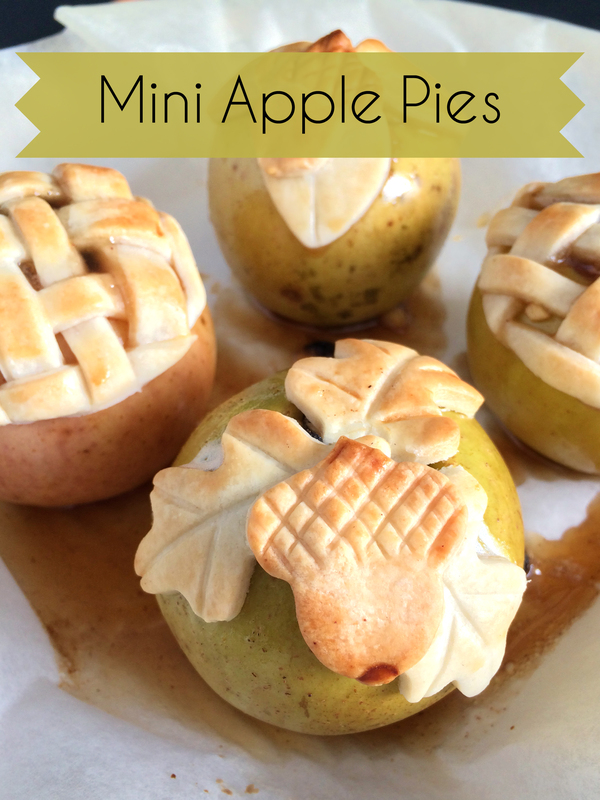 Let me just tell you – these mini apple pies are nothing but pure delicious joy. They are so easy to make and only took me about 10 minutes to throw together thanks to my favorite baking season cheat. As you can see from the above picture, the apples I had were very small. They were barely as round as the quarter measuring cup. I listed the measurements I used and have a serving size as two apples since most I see are larger. These sweet little apples were the first ones of the season so they are tiny. 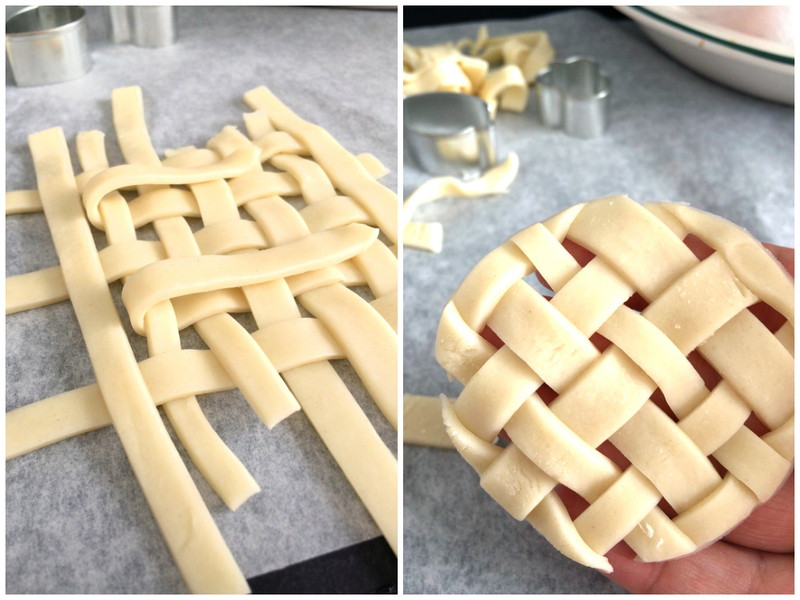 These adorable lattice crusts are so easy to make compared to a full size pie. Simply cut smaller strips from a full size crust sheet and weave them together. To get the perfectly round top, press a glass or round cutter and voila – instant lattice cuteness! My other favorite way to make traditional pies is to layer dozens of cutout shapes. Here I used mini leaf and acorn cookie cutters. At Christmastime my pies are adorned with layers of trees, gingerbread shaped men or snowflakes. I am constantly playing with different crust styles and patterns. I assembled all my ingredients and at the last minute I decided to throw in some dried currants for some added texture and flavor. You could also use raisins or any other dried fruit you love. 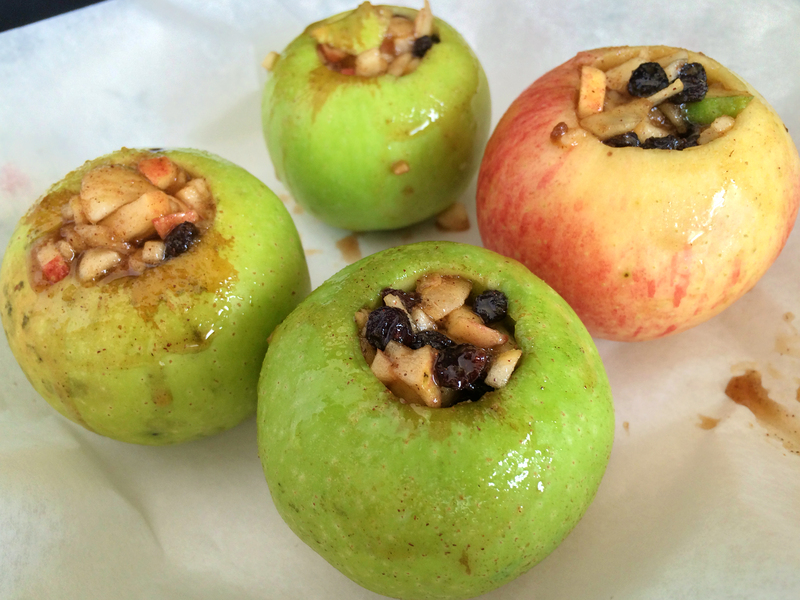 I also cut as much of the fruit I cored as possible and use it in the filling. Side note: The number one trick I have for you to make these even simpler than they already are is parchment paper. If you look through some of my other posts you will see I use parchment paper all the time. I love how non-stick it is and makes cleanup so much simpler. Scrubbing baked on sugar syrup has proven to be one of the most frustrating tasks I’ve ever had to accomplish in the kitchen. Don’t make that mistake. Another thing I just have to share with you is the below picture which had me cracking up. When the apples were finished I took all the photographs and returned them to the oven to stay warm until my husband was home. About 20 minutes later I was sitting on the couch and heard the oven click. I ran over and pulled them out and two had exploded. Thankfully, they had not burned and were still delicious! 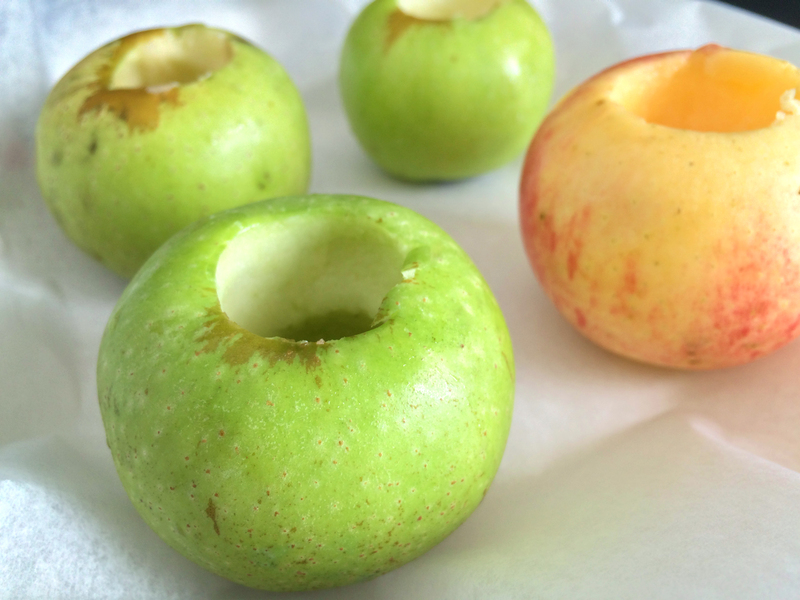 Core apples using an apple corer or melon scooper, leaving the bottom intact. Place in baking dish or pie plate lined with parchment paper. 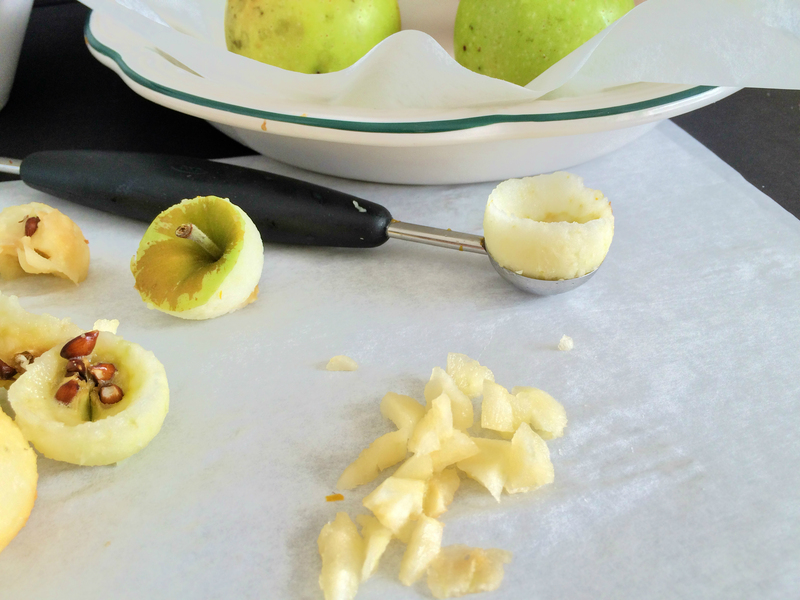 Remove as much apple from the cored pieces as possible and chop finely. In a bowl, combine with cinnamon, nutmeg, brown sugar, maple syrup and currants. Set aside. Gently unroll pie crust and cut shapes. To make lattice, cut thin strips approx. ¼ inch wide and weave before cutting out with a glass or round cutter. I would explain how to weave but would do a terrible job so click here for a full video tutorial. 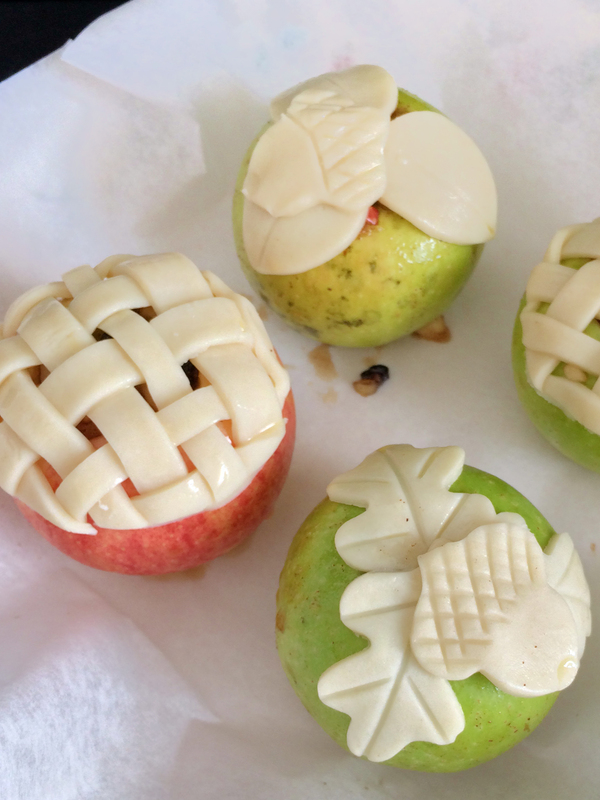 Fill each apple to the top with filling before placing crusts on top. Lightly whisk egg white with a small splash water and brush on top of crusts. 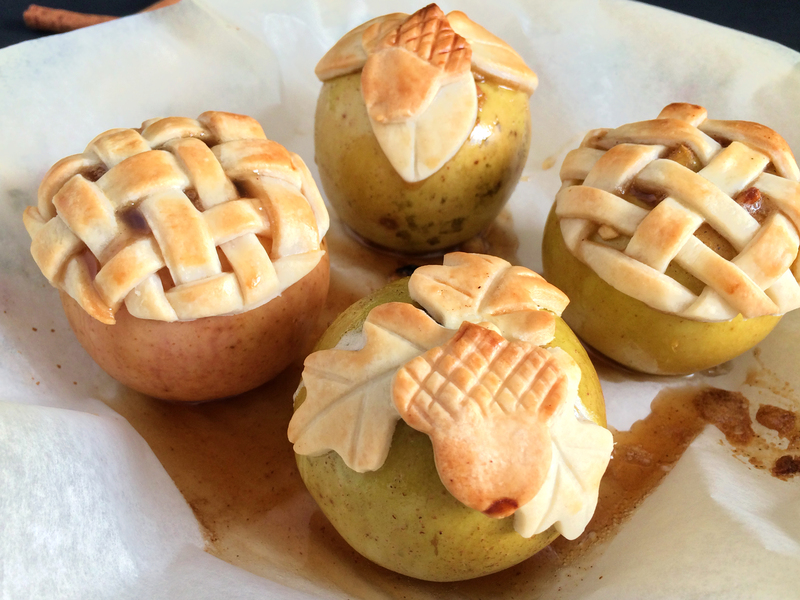 Bake uncovered for 25 minutes or until apples are soft and crust is golden brown. 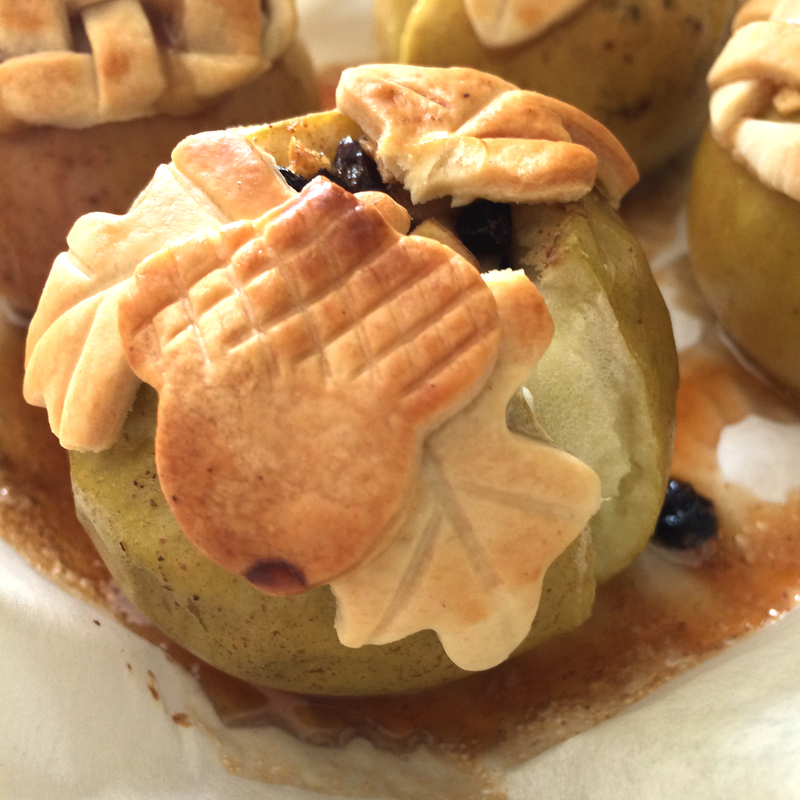 This entry was posted in Fall Favorites, Other Desserts, Thanksgiving and tagged apple, fall, pie, thanksgiving. Bookmark the permalink. You are awesome! Katherine and I can have these minus the crust on top. I can’t wait! Thanks Amy! I wonder if you could substitute a sprinkle of oatmeal or shaved coconut on top for a little crunch? Love this idea! Great individual dessert idea. Those apples look quite delicious! 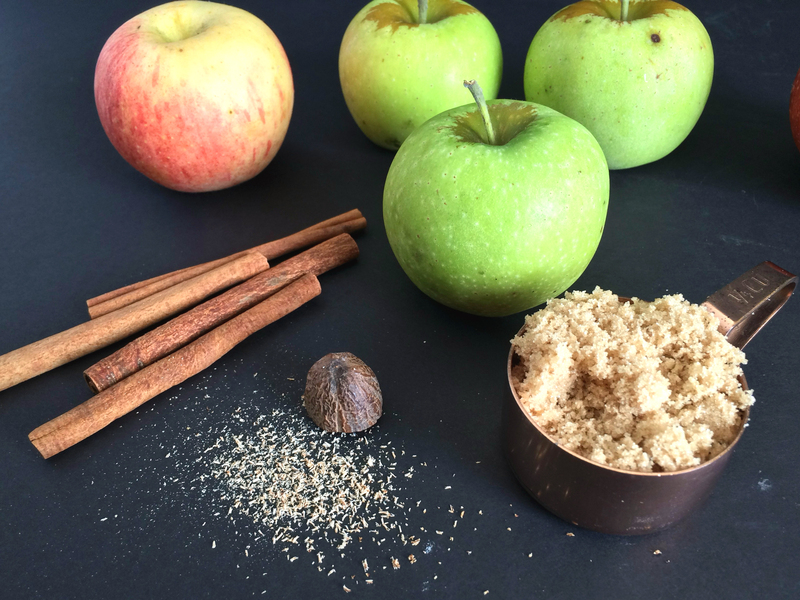 And that’s the kind of recipe I love: simple, beautiful and delicious. Thank you. These look yummy, I can’t wait to try them. Thanks for posting !! !